The Death Egg mk.II Zone Boss is the final boss of Sonic the Hedgehog 4: Episode II. After a short act, the boss is revealed to be the "heart" of the new Death Egg. 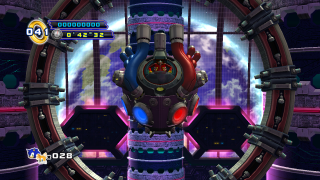 Dr. Eggman starts it up, and the metallic heart attracts 3 giant rings around the boss. Each ring encapsulates the boss in a layer of protection, with the platforms being able to conduct electricity. Sonic and Tails are thrust to the farthest ring, and must navigate the rings to reach the center and attack. Every time the player reaches the center, the boss throws them back to the outer layer again. If the player does not reach the center after a decent amount of time, the boss will levitate the duo and throw them to the outer ring for damage. After enough hits, Eggman will use laser systems to destroy some of the platforms in the rings, making it more difficult to reach the center. The platforms will also conduct electricity more often and faster than before. As a last-ditch effort, Eggman will encapsulate his final machine in a shield, which can only be broken by a Rolling Combo in the final ring. Break the shield, then attack the machine as normal. A few hits this way will destroy the boss. This page was last edited on 24 September 2018, at 08:01.